Help us in our gardens! Have you ever wanted to learn more about gardening, but don't know where to start? Or are you an experienced gardener looking to meet other people who share your green thumb? 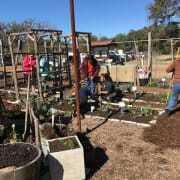 Come help us in our teaching and Inspiration Gardens! Gardeners meet on a variety of days, including Tuesday evenings, Friday mornings, and some Saturdays. No experience or equipment required! Under 16 welcome with a parent or guardian.